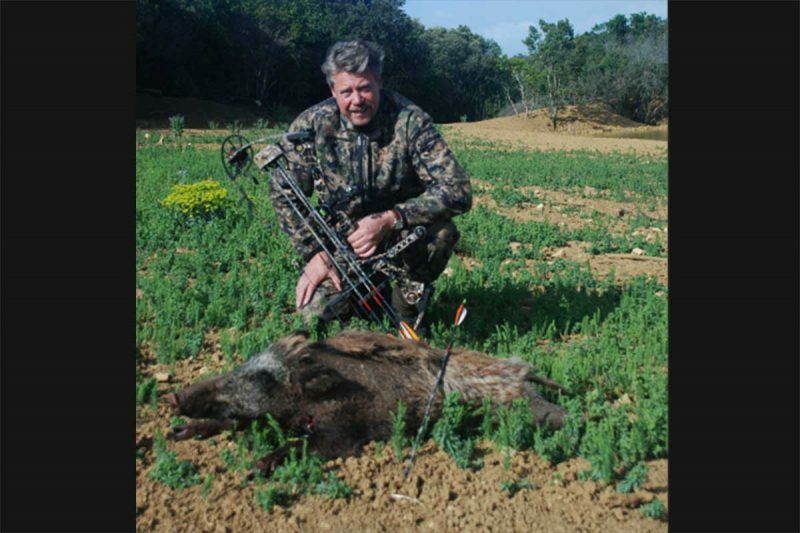 Wild boar hunting / hog hunting / pig hunting and deer hunting in France. Domaine Bois de la Gineste is where to shoot. Boar or hog trophy hunting for big boar tusks as wellas hunting females and younger boar. Domaine Bois de la Gineste offers unique opportunities for hunting big wild boar or hog males or keilers with boar tusks in the medal class as well as for shooting female and younger boars. Each year several gold, silver and bronze medal boar tusks or trophies are taken. For deer hunting Domaine Bois de la Gineste also offers unique opportunities for trophy deer hunting. Red deer stags trophies and fallow deer buck trophies are frequently taken with antlers in the medal class. Domaine Bois de la Gineste offers excellent possibilities for bowhunting. Domaine Bois de la Gineste has got high seats and the elevation allows for short, lethal shots at a distance within 20 yards from the games travel routes. Boar hunting and deer hunting packages are available throughout the year. Domaine Bois de la Ginesteis is consisting of very dense evergreen oak forest with many small open fields and water holes, spread across varied terrain and enclosed within a fully fenced region. The forest has one of the most dense populations of wild boar in France. On top of hunting at sunrise and sunset hunting events are offered under the light of the full moon. Hunting under these conditions is one of the most exciting hunts one can imagine. You can borrow hunting rifles at Domaine Bois de la Gineste. Rifle calibers are 7 mm Rem. Mag. with Zeiss scopes with illuminated reticles. Therefore there is no need for bringing your own rifle. Companies are frequently combining hunts for their clients at Domaine Bois de la Gineste with business seminars or business meetings. Domaine Bois de la Gineste has got the necessary infrastructure to support such activities. Domaine Bois de La Gineste is located in the middle of the well-known Saint Chinian wine district in France in the department Herault. It is located 2 km from the Saint Chinian village. Nearest cities are Beziers (25 km) and Narbonne (25 km). Located in the Languedoc-Roussillion region in southern France only 40 km from the Mediterranean sea lured by superb weather, fantastic nature, numerous historical sites, and beautiful Mediterranean beaches Domaine Bois de la Gineste also provides unique opportunities for numerous family events. On top of hunting at sunrise and sunset hunting events are offered under the light of the full moon. Wild boar hunting under these conditions is one of the most exciting hunts one can imagine. The main building at Domaine Bois de la Gineste is located on the outskirts of the forest, high above the village of Pierrerue affording a magnificent unobstructed view over two valleys covered with wine fields and being an excellent example of the beautiful landscapes that can be found in Languedoc. Four twin-bed guest rooms areavailable -each with an en-suite toilet and bathroom. 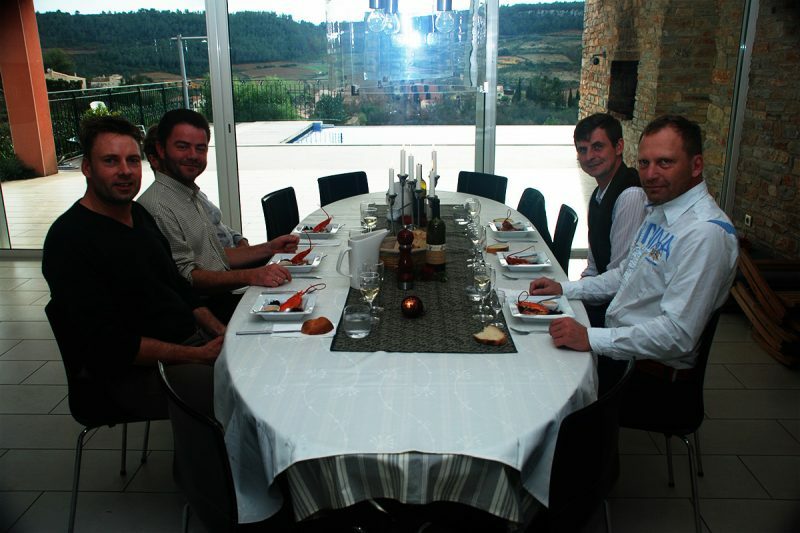 Domaine Bois de La Gineste offers a high class French Cuisine prepared by Le Grand Chef M. Frederic Revilla. Dinner is accompanied by a selection of fine wines.